There are so many DIY projects I’d love to try but which are totally out of my reach because they require insane skills or obscure supplies that I just don’t have access to. As it turns out, though, there are an astonishingly large number of projects which are just as cool and which you can do with nothing more than your faithful glue gun! If you don’t have a glue gun yet, there is no excuse not to go out and get one. The price range is huge, so there is something for everyone. At the lower end, you have your $30 glue gun which is kind of like your Corolla—basic, dependable, and not going to blow the bank. At the higher end, you have your $150+ models, which I guess are more like a Rolls Royce (some even cost in excess of $600!). For most people and most projects, a standard $20-$40 glue gun is really all you need. If you only have a few bucks to spend, you also have the option of buying a mini glue gun. You can snag one of these from your local dollar store for around $3. If you are just getting started with glue gun projects and aren’t sure if this is something you want to get into, I highly recommend grabbing one of these. You’ll be amazed what you can accomplish. And now it’s inspiration time! I want to share with you 40 amazing glue gun projects which are just astonishingly creative! 1. Decorate a vase using hot glue. 3. 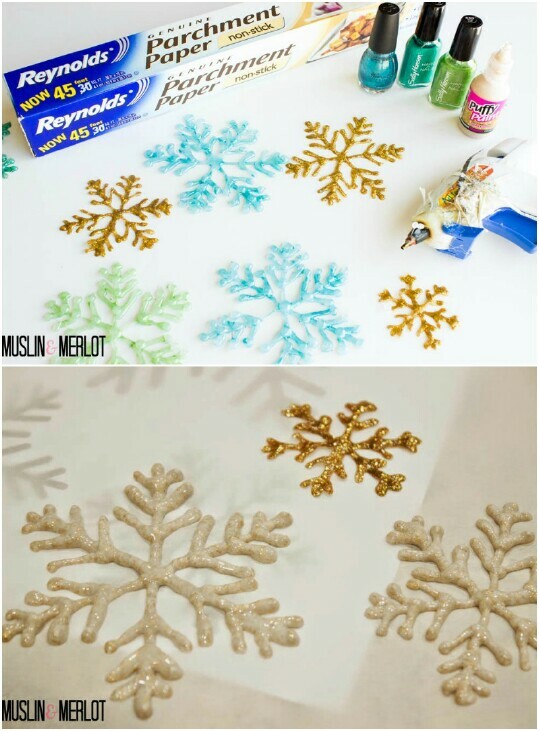 Make glue gun snowflakes. 4. Make coasters the easy way. 5. 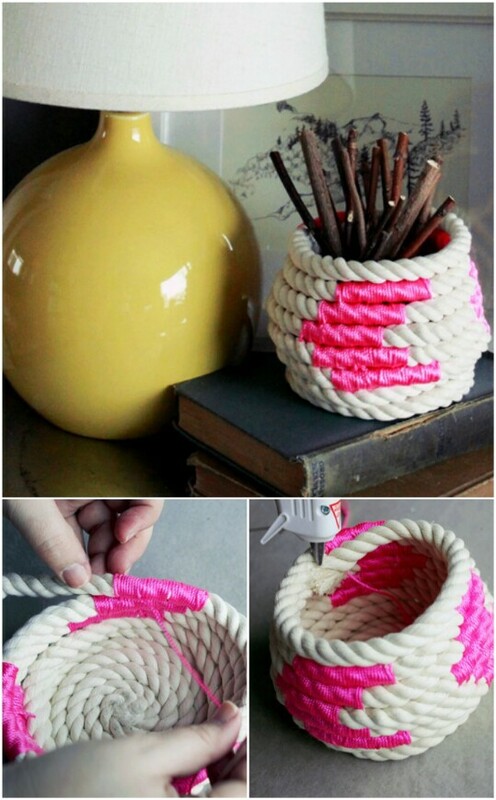 Create a coiled rope basket. 6. 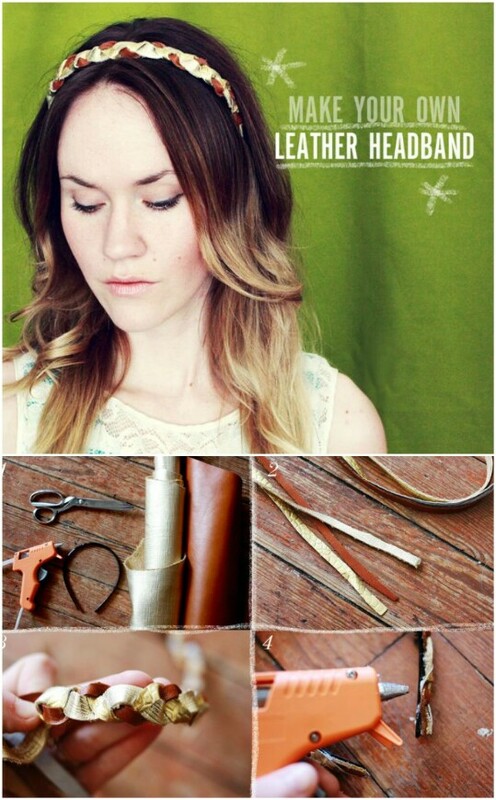 Make a beautiful headband out of scrap leather. 7. Make a Harry Potter wand! 8. 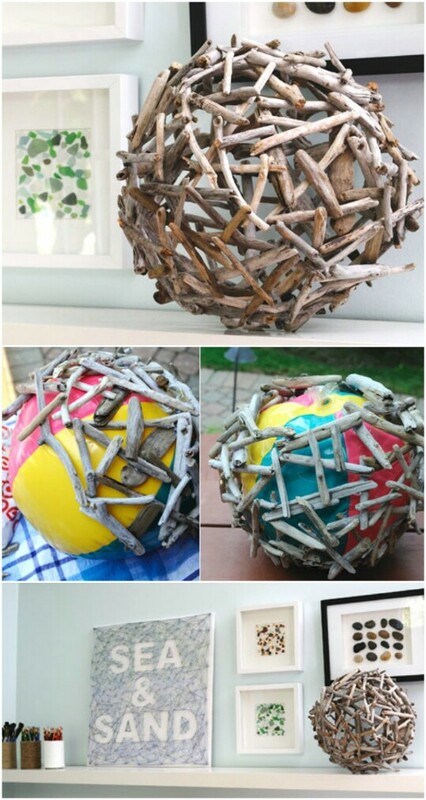 Create an orb out of driftwood. 9. 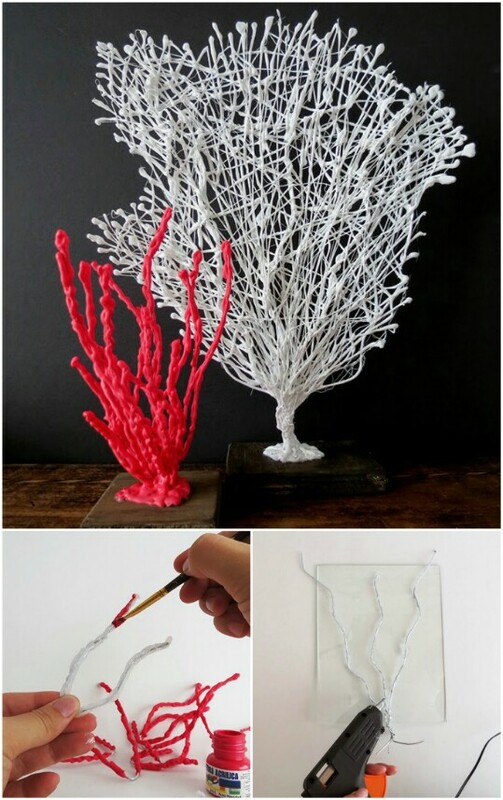 Build a coral wire sculpture. 14. Look at these snazzy hot glue earrings! 17. This Ice Queen Masquerade Mask is Coooooool! 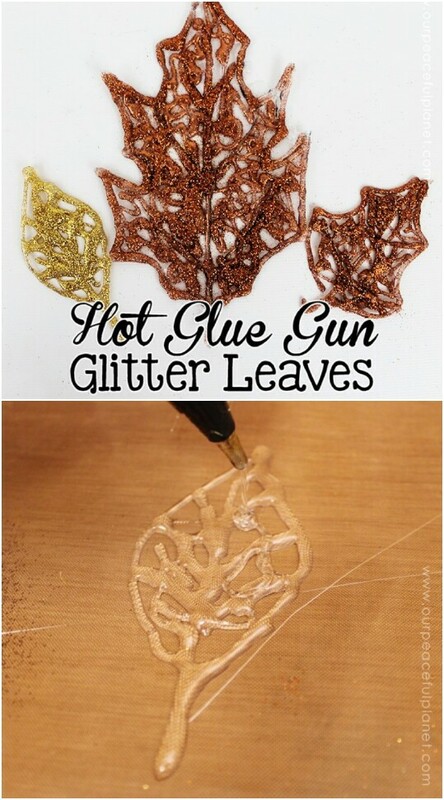 19 Make beautifully sparkly fall leaf decorations out of hot glue. 28. Hot Glue Rings will Impress and Delight! I always thought of hot glue as something you use just to stick things together, but you can actually make really cool decorative art with the glue itself. One great example is this easy project for decorating a vase using tabs of hot glue. You can even write with the glue. Spray paint over it and the glue looks like it is just part of the vase. This project teaches you how you can write on a piece of wood using hot glue and make a cute little decorative sign for your home. You can write anything you want and even add designs if you’re feeling a little extra creative spark! This project is similar to the one for making fall leaves, except instead you will be making snowflakes. The supplies you need are again really basic: the glue gun and hot glue, parchment paper (not wax paper), and nail polish (for the color). If you need help making the snowflake shapes, you can use a printable to guide you. Otherwise, use your imagination and have fun. Another cool idea might be to make paper snowflakes, and then use those to guide you when you create the hot glue shapes! Whether you are throwing a dinner party and want to do something special, or you just want something for everyday life, this project will teach you how to make your very own coasters! They are beautiful and functional, and they have a great rustic appeal. You literally just need some twine and hot glue. 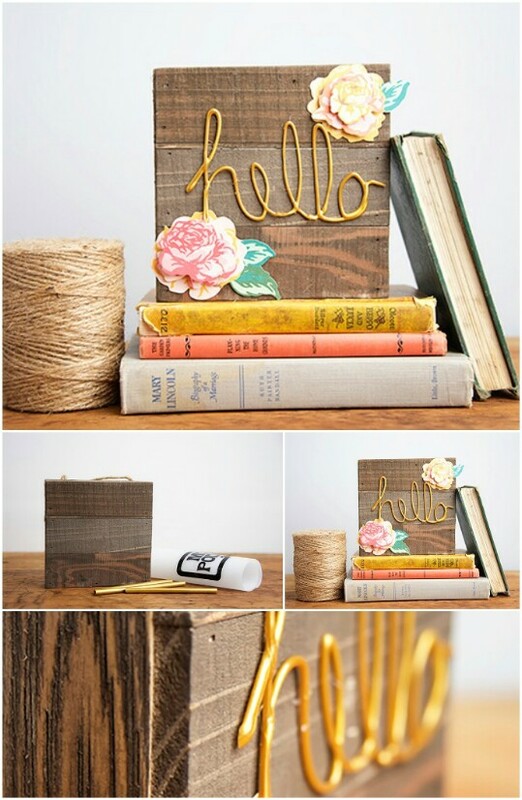 You wind the twine around and glue as you go, and ta da! You have coasters you can use or gift! This project is similar to the one above, but it is the “3D” version of it. 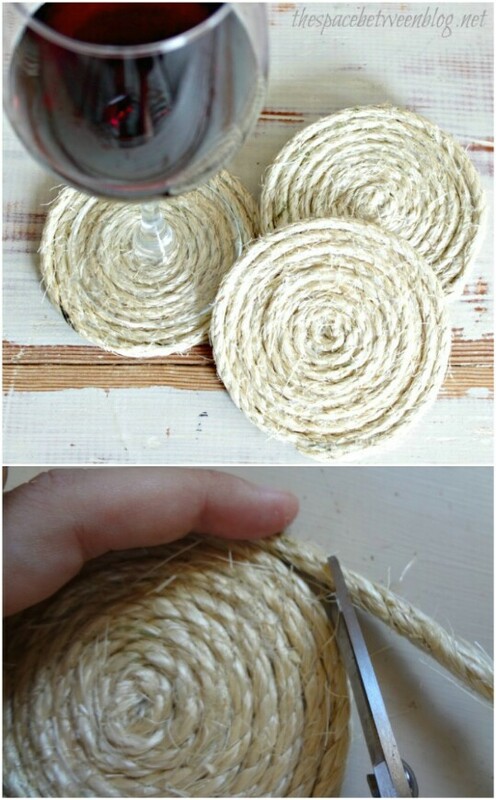 Instead of coiling twine while it is lying flat on the table, you coil rope upward, gluing as you go. This basket features some hot pink mason line which is added as a decorative element here and there. You could purchase rope and line in any colors you wanted, and you could even get quite elaborate with the designs if you wanted to. 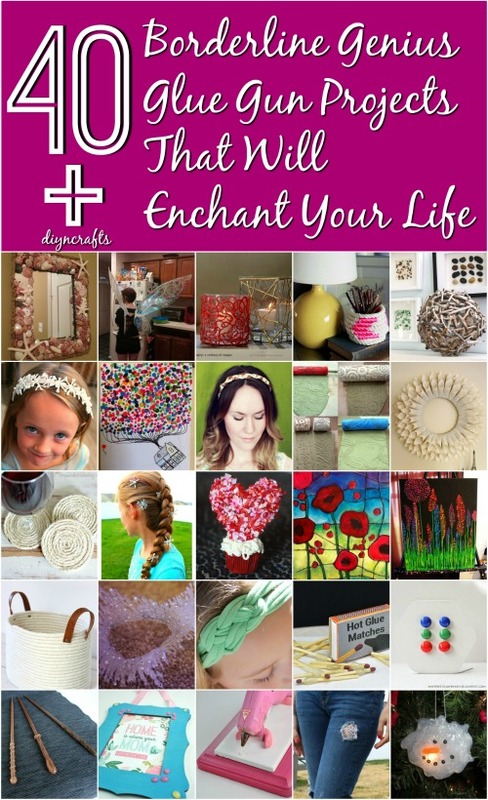 It’s a beautiful and creative project which would be easy to personalize. The finished result is useful, and would also make an awesome gift! Have some old pieces of scrap leather or vinyl lying around unused from other projects? 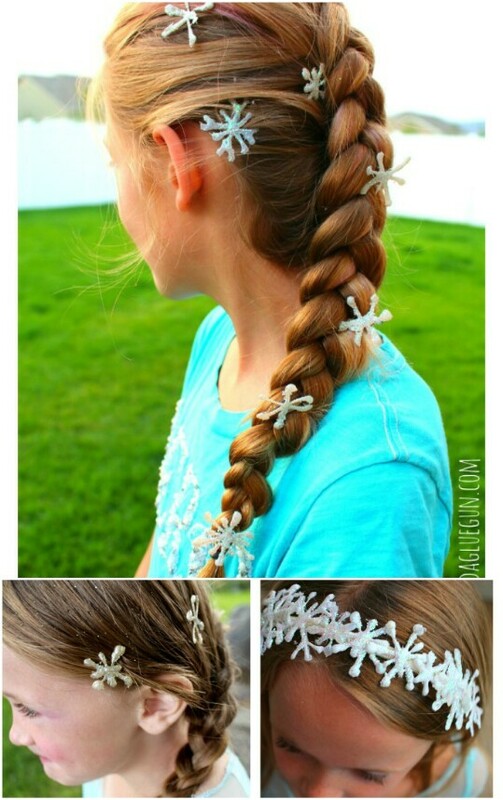 This project will teach you how you can transform them into a lovely hair accessory! You just braid the pieces together and glue them as you go. After you finish, you can wear the headband around the house for a bit to make sure that you didn’t miss any spots. If you did, you can go back and glue them. Your headband will be finished and you can wear it everywhere. I imagine while doing this project you might also come up with some other inspired ideas for using leather scraps and hot glue to create cool accessories. Project Source and Instructions: abeautifulmess. Have a kid who loves Harry Potter? Want to throw the best themed birthday party ever? Then there is nothing like adding a few awesome props/party favors! These look surprisingly easy to make. You just need to buy a pack of bamboo cooking chopsticks and some brown acrylic paint and foam brushes. 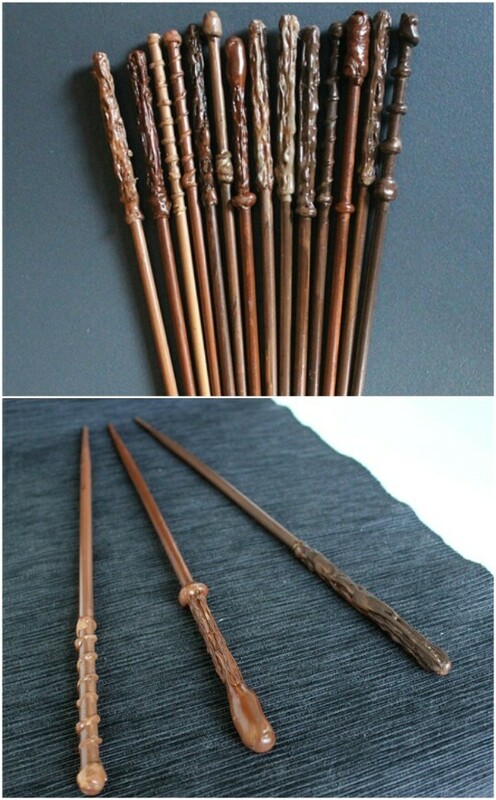 You use the hot glue to create the knobby textures which function as the grips for the wands, and then you paint over them so that they look like they are made entirely out of wood. It’s a very clever idea, and the finished result looks quite good. I can’t imagine how stoked this kid was. If you want to learn how to do something that’s totally artsy and amazing with hot glue, then check out this project to build an orb out of driftwood. Looking at it, you’d think assembling this thing would’ve been nightmarishly difficult. The finished project looks like it’s defying gravity. But it’s actually shockingly easy. All that the artist did was inflate a beach ball, and start laying pieces down on it, gluing them together to create a lattice as she went. Once the entire beach ball was covered and all of the driftwood pieces were firmly attached to one another, she just deflated the ball and pulled it out through one of the holes. Genius! I never would have thought of that in a million years. My mind is totally blown! Here is another project which is very artsy. These coral fans were created using wire, hot glue, and acrylic paint. All you do is use wire-wrapping techniques to sculpt the shapes of the branches, and then you add hot glue gun to create the bumpy textures. After that’s done, you just paint over it in white or red, and then you affix the finished result to the wood stands. This project would be time-consuming, but probably not too difficult, and the finished coral fans look absolutely awesome! Recall the snowflakes made out of hot glue from earlier in the list? This idea is just a new twist on that one. Instead of using nail polish to add color however, Kimbo over at A Girl and a Glue Gun came up with the idea of using glittery spray paint. The result looks really cool (pun intended—I know, not the best one, right?). Kimbo used hot glue to attach bobby pins to the backs so that the snowflakes can be worn as hair clips! They made the perfect finishing touch to her daughter’s Elsa costume. Looking for an easy way to add textured patterns to clay? One great trick is to create a roller which has the texture already on it. Naturally this isn’t a supply you are going to find just anywhere, so it is something you need to make yourself. Of course, what is cool about this is that you can customize it with any type of design you want. You need to start with some kind of a roller—it doesn’t matter what, something like a PVC pipe or an actual rolling pin works fine. You then are going to use a sharpie to draw a pattern onto the pin. Once you have something you like, you go over the top of it with hot glue. 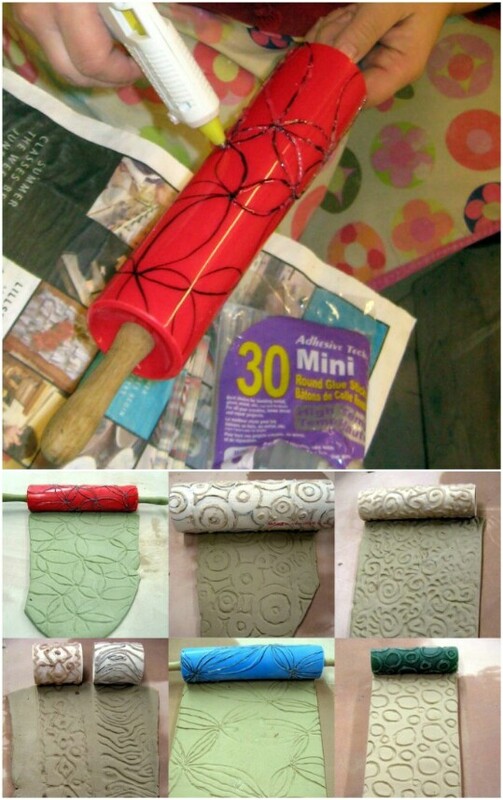 Wait for it to dry, and you’ll have a roller covered with a texture that can indent soft clay. This makes it a breeze to create beautiful repeating patterns! This project works on the same premise as the coasters and the little rope basket from earlier, only this time you are going to be doing it on a much larger scale. This is quite a large bag with handles attached which you can use to carry stuff around. I would probably only put relatively lightweight objects in here so as not to strain the glue (like the yarn balls in the photo). This project makes clever use of a pail. 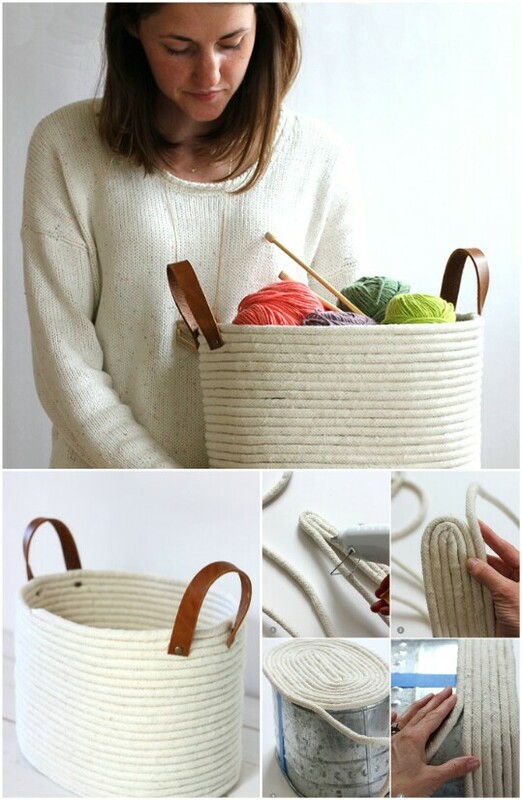 You use the pail as a guide for the rope as you put it down. The pail holds the shape of your creation while it is drying. You follow the same basic process that you used on the smaller rope basket from before. The finished basket looks incredible! Have a boring, basic vase that you want to add a little pizzazz to? This project is an awesome way to do it! 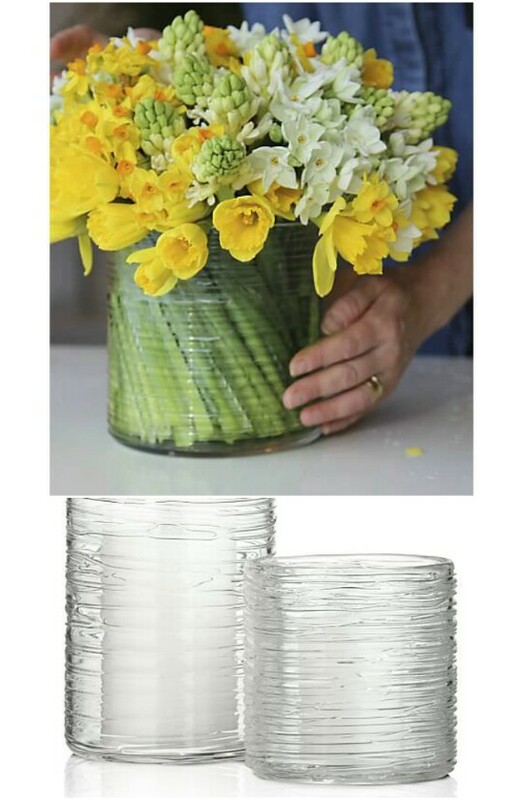 You literally just get a plain, clear vase and work your way around and around it with a hot glue gun and then wait for it to cool. You will get an awesome texture! Want to add a really nifty item of jewelry to your collection using a few cheap supplies and a lot of imagination? 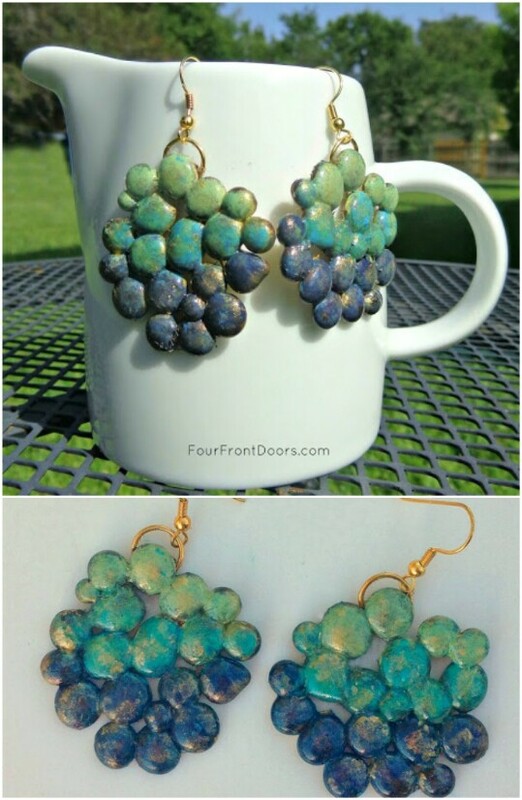 These earrings are made out of cooled droplets of hot glue which have been coated in acrylic paint. 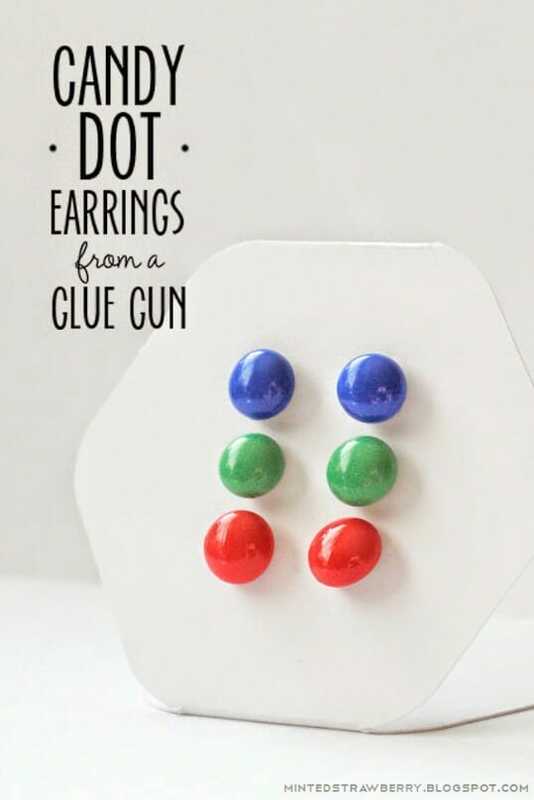 It is easy to identify them as hot glue since they are in this list, but if you just ran into someone wearing these somewhere at random, would you have ever guessed their earrings were made out of glue? These are awesome not only because they have a quirky design, but also because they must be delightfully lightweight and comfortable to wear! You could modify this design into a lot of different nifty ideas too! There is nothing quite like hot glue for creating simple shapes easily and quickly which you can use for just about anything. 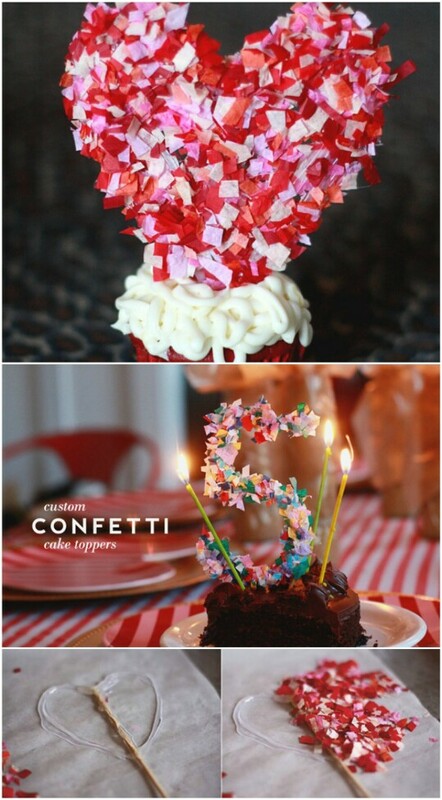 This project just involves making the number or letters or whatever other shapes you want with hot glue, inserting a toothpick, and covering the result with confetti. The confetti conceals the glue and looks festive and fun. This would be an easy and fast way to jazz up any cake! This project is similar to a number of glue gun ideas we have already shared with you, so you should by now have a pretty good idea how to do it just from a glance. 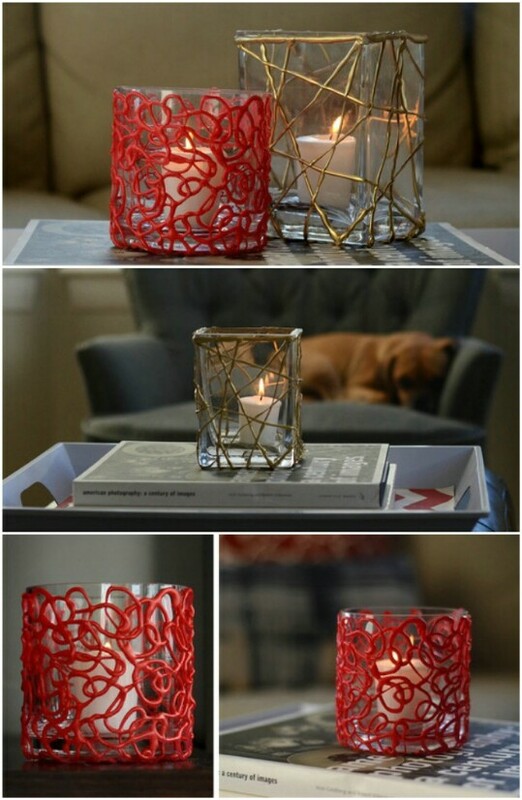 You cover a candleholder in glue gun in whimsical patterns, wait for it to dry, pull the candleholder out, spray paint the glue, and then insert the candleholder inside again. 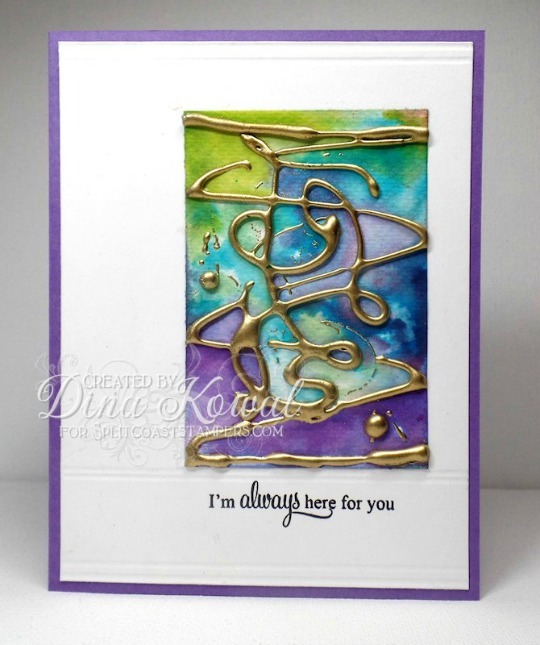 I especially love the effect she achieved with the metallic gold paint. It gives the striking illusion that the candleholder really is covered in a cool metal sculpture and not just dried glue! Just looking at this, I get so many different ideas for cool patterns and colors you could try! 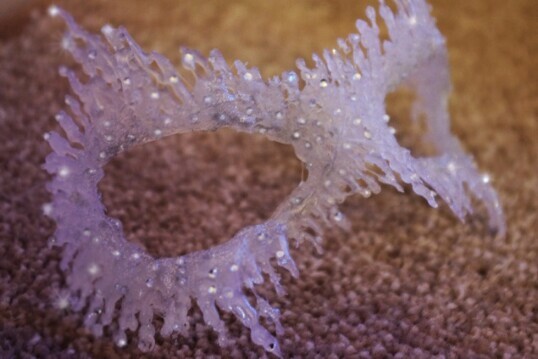 If you liked the snowflake projects earlier, then you will love this masquerade mask which would be suitable for any ice queen or snow queen! It really is astounding that this is made out of hot glue; it truly does have a spectacularly icy look to it. This would make a great addition to a wintry costume. If you liked the earlier project for turning leather scraps into a headband, you will love this simple variation. This project is very similar, but instead of upcycling leather scraps, you’ll be upcycling an old T-shirt! You don’t need anything for this project except the old shirt and your hot glue and a pair of scissors. 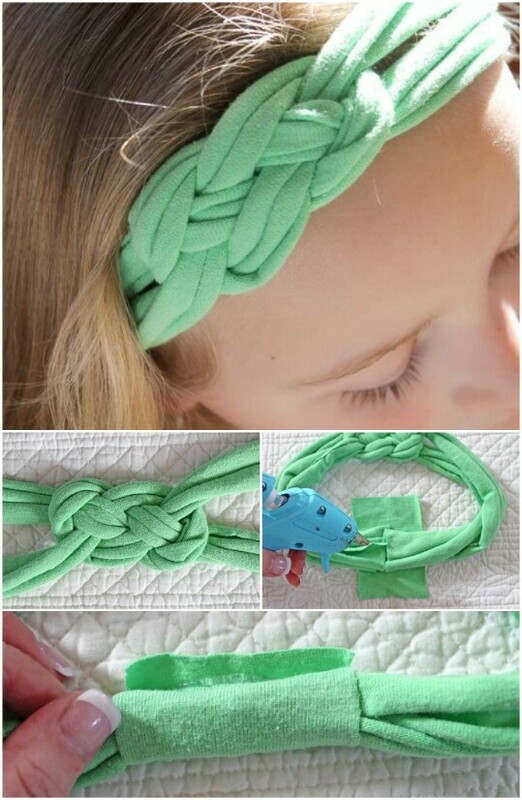 The project does require you to tie some rather complicated-looking knots, but the tutorial is easy to follow, and the finished headband is so cute! Looking for a project for fall this year? This easy project teaches you how to make autumn leaves using nothing more than hot glue, glitter, and foil. You can put these leaves in your windows or scatter them around the house to add a little autumnal charm. You could also very well just switch the colors from gold and copper to green and make spring leaves as well! When it gets around to the holiday season, there are so many fun crafts you can do with your glue gun, and this one is particularly clever and easy! 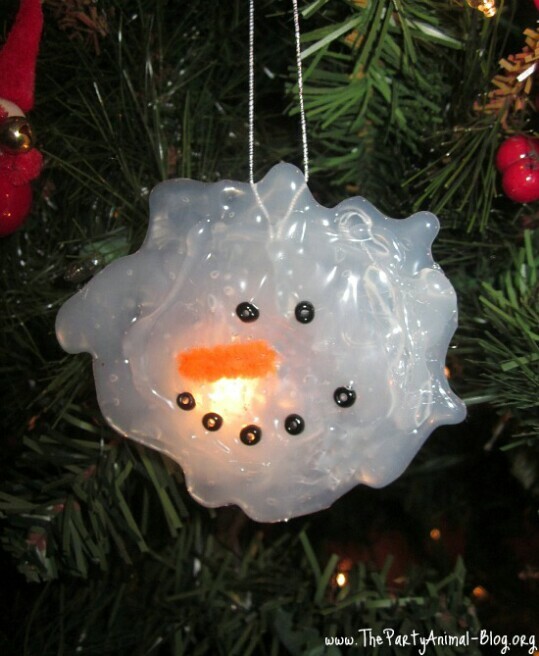 You just use hot glue to make a “melted” snowman face. Personally I’ve never seen a melted snowman that looks so happy! The hot glue lets the light shine through on the tree, so it comes out looking really spectacular. Have a child who dreams of one day becoming a top chef? 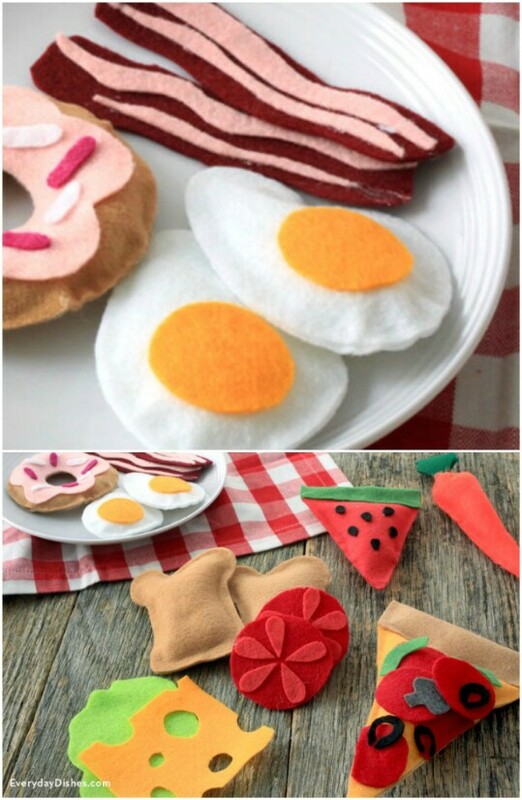 A great way to fuel your young chef’s creativity is by making him or her some felt food to play with. Your child can combine ingredients to build sandwiches and choose main courses and side dishes for play meals. These are great because they are soft, small, and easily portable (perfect for bringing along on trips and such). I imagine that this would also be a cute and simple way to create other little plush toys as well. You could easily take the same approach and make little animals. You don’t need to be a creative genius with shapes to make these food toys though—there is a handy printable template in the tutorial! This may be one of the best beginner projects out there, because it makes everything else you’re going to do so much easier! You’ll learn how you can create a personalized stand for your glue gun using simple supplies. While this is a simple idea, it is one which works great and which you could customize any way you wanted. And then you have a place to set your glue gun while you’re using it and afterward. If you enjoyed the earrings project earlier, you will love this much simpler alternative. These earrings aren’t as eccentric, and may fit better into your wardrobe if you want something a little more sedate. Like the earrings projects, but want to try something a little different? 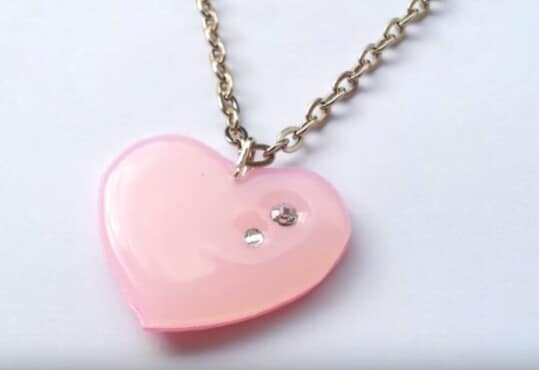 This project teaches you how to create a simple but beautiful heart pendant using hot glue. It’s a video tutorial, so it is really easy to follow along. 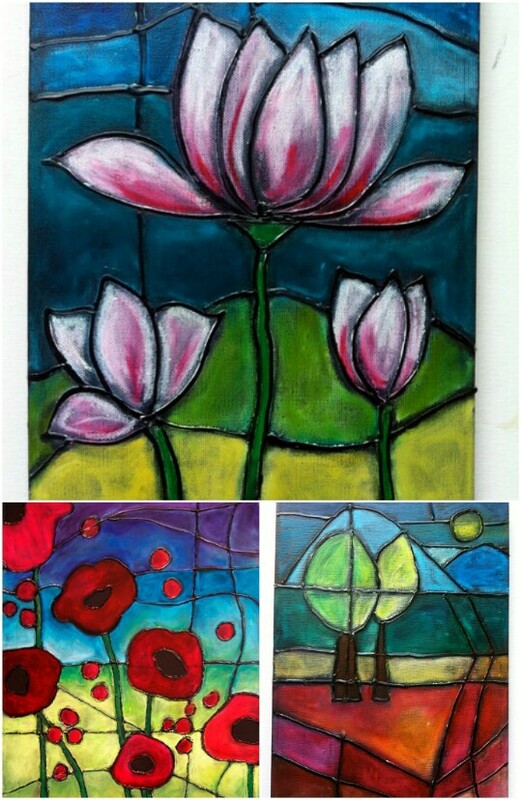 I imagine that these would make great gifts for family and friends too. They’d be easy and affordable to make, and they’d send a creative and sweet message! Have a pair of jeans with a hole in them that you just can’t bear to part with? You don’t have to if you can make the hole look decorative instead of tragic, and there is no easier and faster way to do that than to use lace and hot glue! 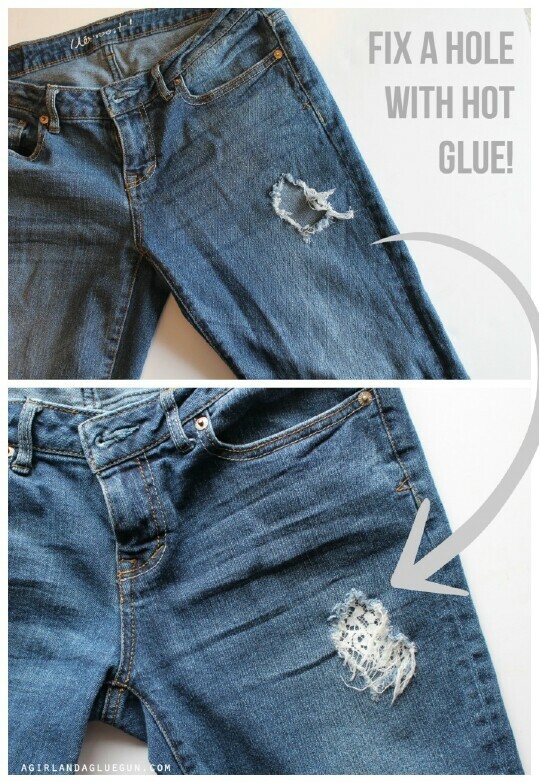 To do this project, you just turn your jeans inside-out and hot glue the lace patch over the hole. Wait for it to dry, and you’re all set. The patch looks very chic! This project needs a number of supplies, but they are all pretty simple and straightforward. 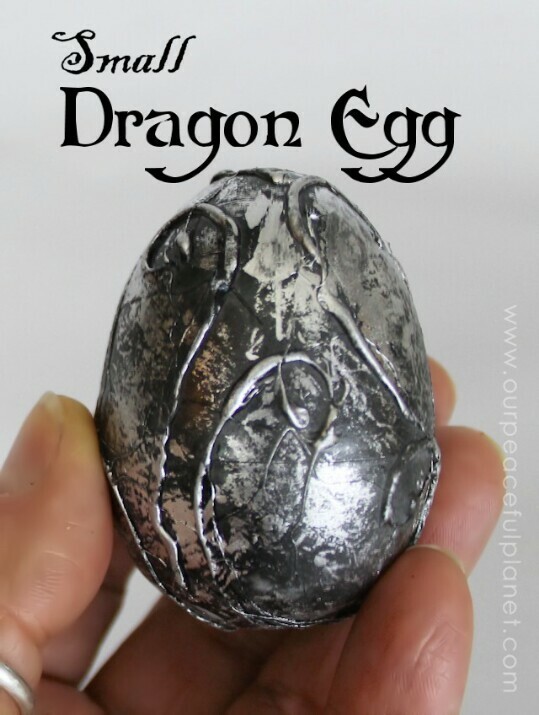 You can use any type of plastic egg you want. You need a couple colors of paint—black and silver (or a metallic color of your choice)—sand paper and tissue paper or toilet paper. I’m amazed at the gorgeous textures she’s managed to create with this project. This looks like a very fun and creative way to spend an afternoon! This would be a great project with kids who are into fantasy stuff! 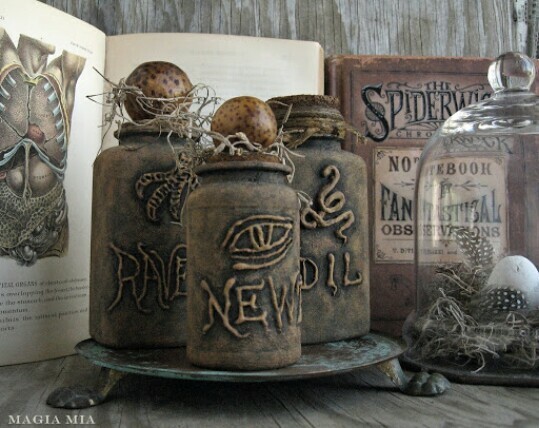 While we are on a fantasy theme, you have to check out this project to create “occult” apothecary bottles! These would be great for sprucing up the home around Halloween—or again just a really great project if you want fantasy-themed decor. 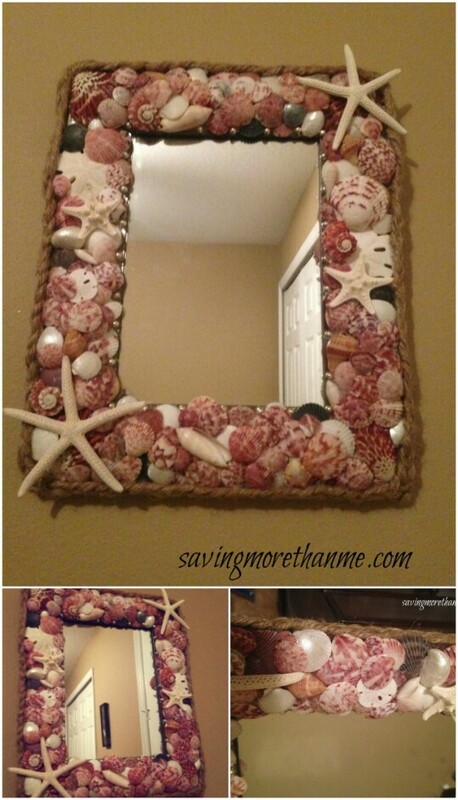 What really blows me away about this craft though is the “before” and “after” photos. I can’t believe that these bottles started life as ibuprofen containers, vitamin bottles and seasoning tins! This jewelry project actually is similar to the previous crafts I shared for making leaves and snowflakes. You are going to use hot glue and colored glitter to create flat “scribbles”, and then you will wait for them to dry. At that point, you can roll up the scribbles into a ring shape and use a dab of hot glue to connect the ends. Optionally, you can add rhinestones or other embellishments. 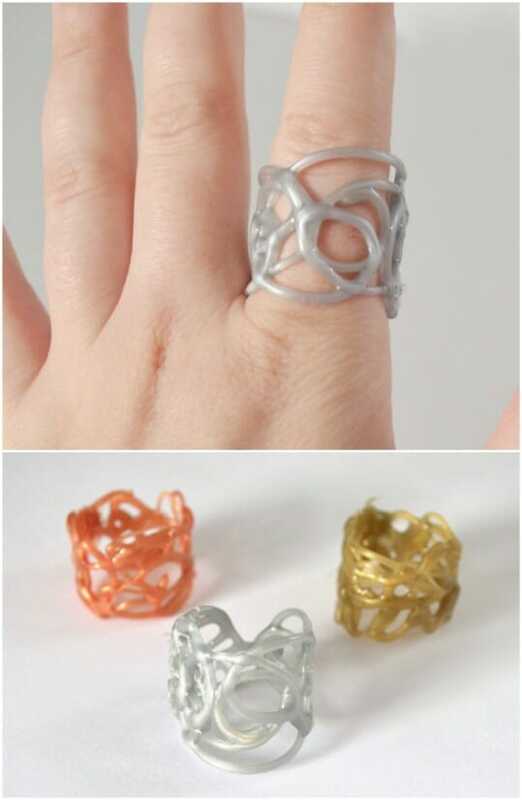 The finished rings are very artsy and quirky! You might think that a hot glue gun and electronics are two items that should never go near each other, but it turns out that hot glue makes a pretty awesome cover for a memory stick. 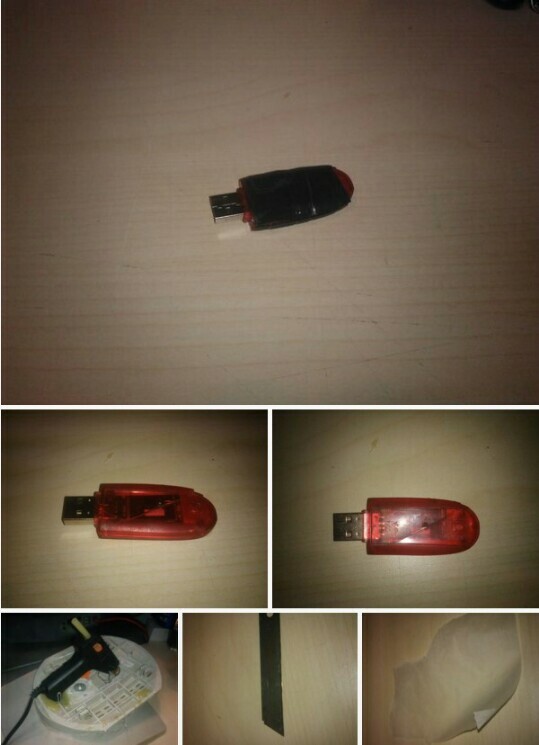 You will notice from the steps that this project requires you to remove the existing flimsy plastic cover from the memory stick, and yes—you will be applying the melted glue directly to the gadget. Personally I find it shocking this works, so I would recommend that you make sure there is no data on your stick first, just to be safe! Once the hot glue dries, it has a cool translucent effect, and the light shines through it in a neat way. Incidentally, it is also waterproof, technically tougher than the original case, and more likely to protect the electronics inside should you happen to drop it. If you enjoy pallet projects for crafting tables, shelves, and other furniture, you will fall in love with this idea! 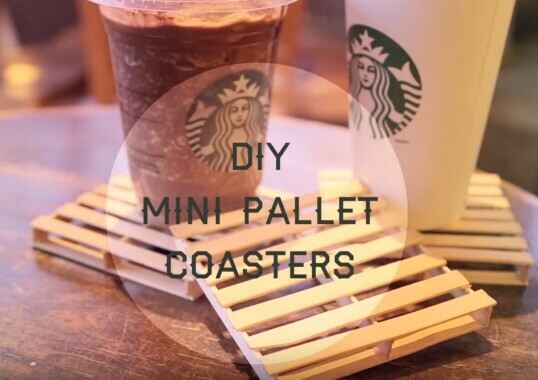 For this project, you will be making miniature pallets using popsicle sticks! The video teaches you how to glue them together into drink coasters. These fit in perfectly with current trends in rustic home décor, and would make a very cute statement especially if you actually have upcycled full-size pallets in your house! Usually you put a stick of glue in a hot glue gun. The glue gun melts the stick and you use it to stick things together or make fun shapes and textures. But you don’t have to put glue in a hot glue gun. You can also use other materials. One awesome thing to try is inserting a crayon instead. 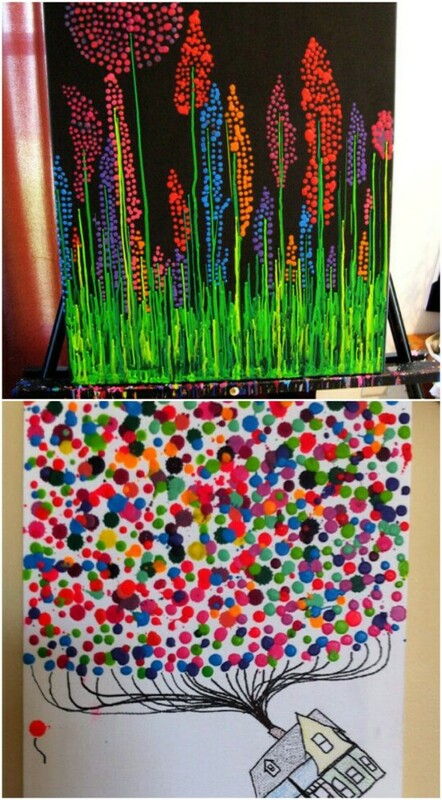 The glue gun melts the crayon, and you can then use it to create all kinds of mesmerizing masterpieces! Wow, when I first saw this, for a moment I thought I really was looking at real stained glass! But this is actually an illusion created by hot glue and oil pastels. This looks like a challenging project (especially since the tutorial isn’t free), but you could create all kinds of amazing images once you got the process down. Here is another awesome craft for those of you out there who enjoy fantasy stuff! 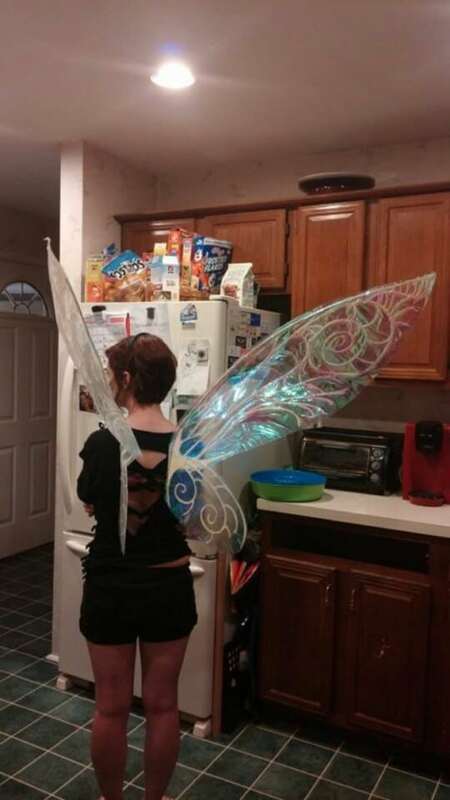 You can make these fairy wings using nothing more than simple everyday materials: cellophane, thin poster board, glue, scissors, a knife, hanger wires, an iron, glitter, and of course, hot glue. The finished wings have a beautiful gossamer look to them. They are absolutely gorgeous, and would be perfect for cosplay or for wearing to a fairy festival. If you enjoy paper crafts, maybe you make your own cards for holidays, birthdays, and other special occasions. If you are looking for a cool way to add some texture and dimension to a card, you can do it using hot glue. There is a full tutorial! 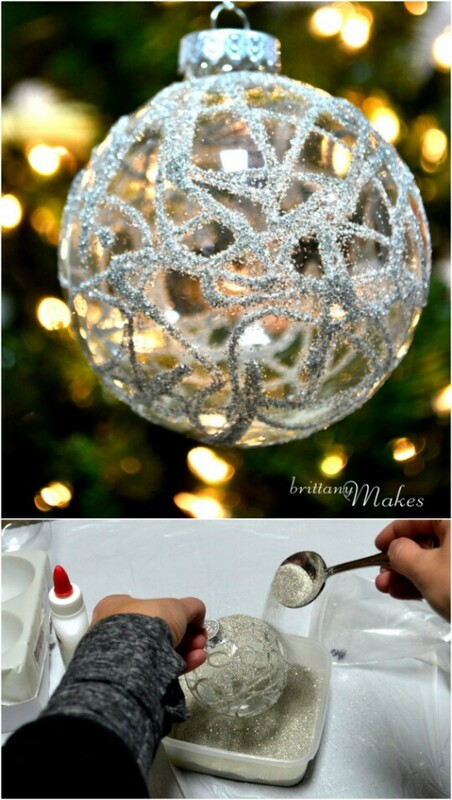 Earlier I showed you how you could use melted crayons and a hot glue gun to create beautiful Christmas ball ornaments starting with a plain transparent ball. This project uses a similar idea, except that you’ll be using hot glue and sparkly glitter to cover the balls instead of crayons. These must sparkle beautifully in the lights from the tree! 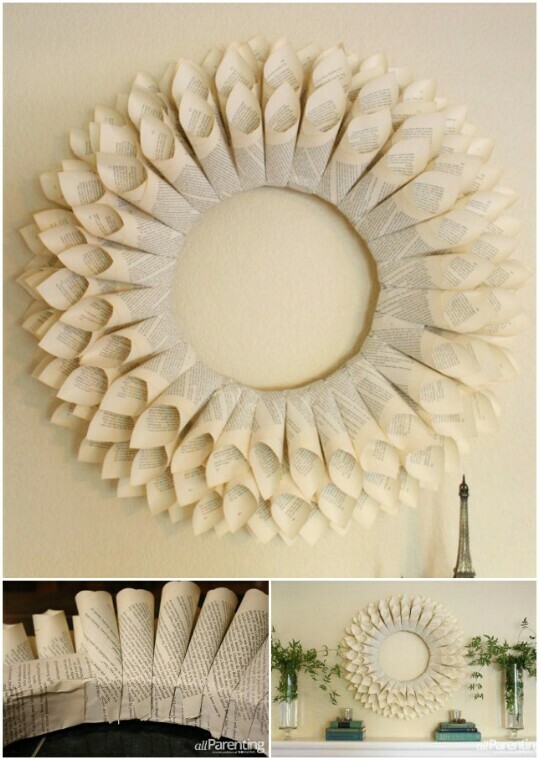 If you want to add some vintage flair to your home, one way to do it is to take a vintage book and tear the pages out and create a wreath out of them. This is a fantastic paper craft. It’s highly involved, but the result is quite dramatic! I imagine this would also make a fantastic frame for a round wall mirror. 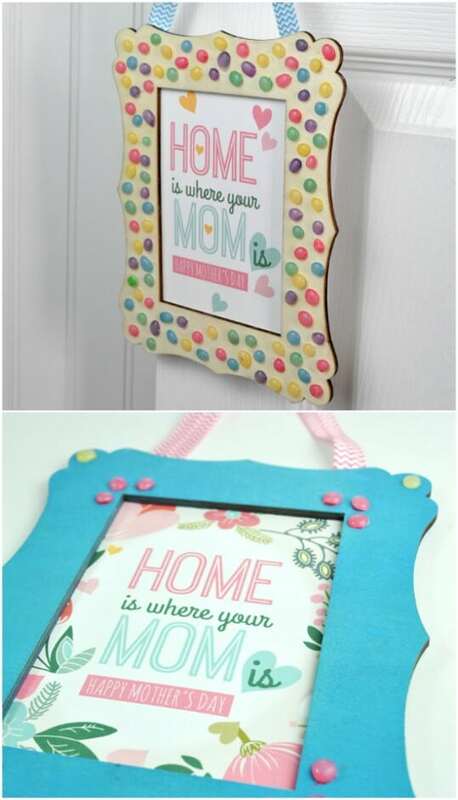 With this project, you will learn how you can embellish a picture frame using little globs of hot glue colored with nail polish. The finished globs remind me a bit of candy for some reason—and a bit of glass globs as well. It makes for a very colorful, vibrant, happy look. You could use this idea to embellish all sorts of things. Hot glue can be used to make all kinds of unusual organic shapes and designs, and it really does work awesomely for making all kinds of jewelry! With metallic paint, it does imitate actual metal pretty well, and has kind of a soldered look. 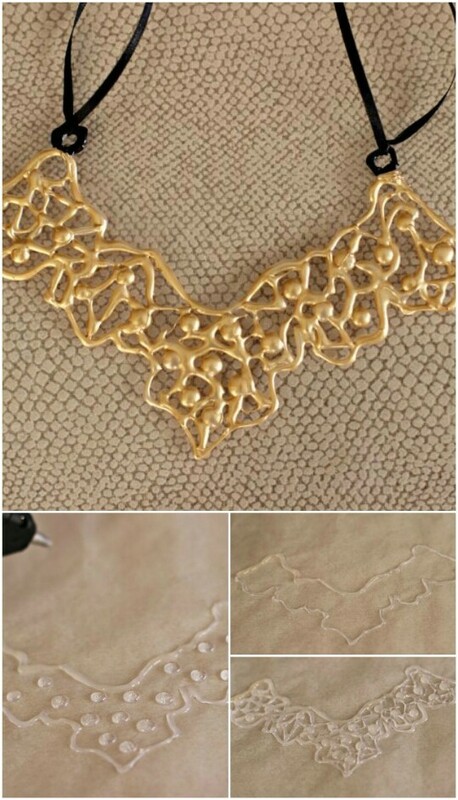 With this project, you will learn how to make a quirky but elegant gold statement necklace. One bonus with this project is the fact that the glue would weigh next to nothing. If this necklace were made of real metal, it would probably be pretty heavy! What home couldn’t use a little splash of nautical design? This tutorial will teach you how you can transform an ordinary mirror into something that you’d find in Ariel’s bedroom. It’s absolutely gorgeous, and surprisingly easy to make, thanks to your trusty glue gun! Problem solved! In this video tutorial, you will learn how you can make hot glue matches. 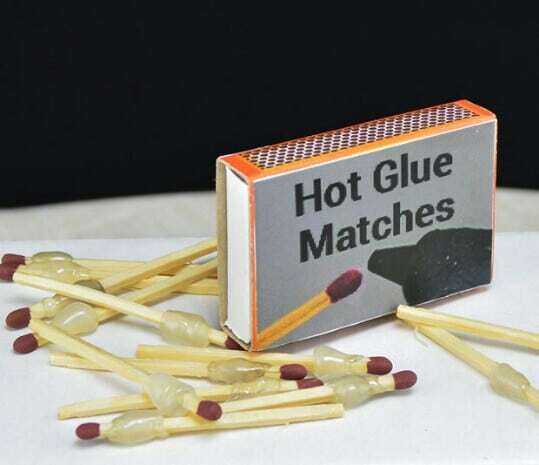 They’re just simple matches with a dab of hot glue dried on them just below the match head. The idea is that when you need a dab of hot glue in a pinch while you’re out and about, all you have to do is light the match. The dab of dried glue will melt again, and you can use it. If you need a couple more dabs, just use a couple more matches. What an awesomely useful and creative invention! I’ll bet if you don’t already own a hot glue gun, you are now grabbing your car keys and planning a trip to your local craft or dollar store! You only need a few dollars to buy a mini glue gun, and once you have it, you will be able to tackle all of these amazing projects! Do you have eBook? if so kindly email me so i can download and print it. The glue dots gave me an idea. I wanted to have swatches to glue to my nail polish bottles. Unfortunately, not only are they hard to find, they can be expensive. Making dots on parchment, painting them with the polish, and then gluing them to the tops of the bottles would be SO easy!